First it was Democratic lawmakers, then it was the Office of Government Ethics, then a Republican senator, and, most recently, a nonprofit ethics group. All are demanding further investigations of whether Commerce Secretary Wilbur Ross failed to properly disclose or fully divest his financial holdings—estimated by Forbes magazine at $700 million. CREW cited reporting by Forbes, which on Aug. 6 hit Ross with another in a series of stories, this one detailing allegations from former investor colleagues filing a lawsuit and saying he “robbed them of money,” and falsely claiming that his Wall Street firm had never been fined by the Securities and Exchange Commission. Ross’s incomplete financial disclosures and ownership of shares in a shipping company tied to Russia prompted demands for investigations last November from Democratic senators led by Sen. Richard Blumenthal, D-Conn. This June, Blumenthal joined with Sen. Elizabeth Warren, D-Mass., and Rep. Elijah Cummings, D-Md., in asking SEC Chairman Jay Clayton to look into the share trading in the shipping firm. 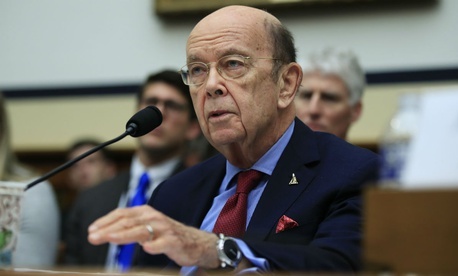 On Tuesday, a Commerce Department spokesman referred Government Executive queries to Ross’s attorney, Theodore Kassinger, a partner in the O’Melveny firm.